SOUTHINGTON - Southington girls basketball head coach Mike Forgione was at a loss for words. After the Blue Knights dropped a third-straight game by four or less points in a 54-50 loss to RHAM Tuesday night, Forgione sat on a table outside the locker room with his head in his hands, searching for answers in a season that has been filled with unexpected setbacks and heartbreaking finishes. The Blue Knights’ 5-12 showing up to this point is not the only symptom of Forgione’s disbelief. The fall from last season’s success has been swift and drastic, and the program’s 16-7 finish last year that included 11 wins in the season’s final 12 games feels like a painfully long time ago. This season was expected to be a step back for the Southington program, though maybe the regression wasn’t anticipated to be of this magnitude. 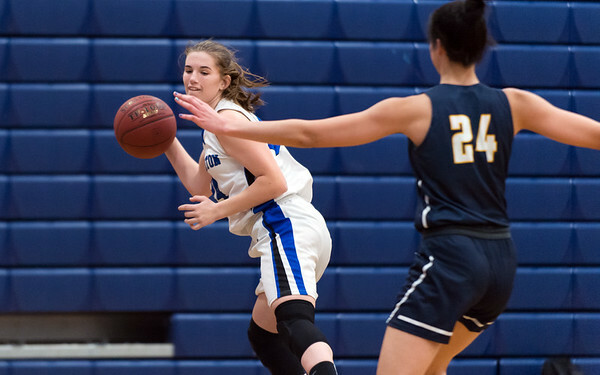 The lone senior on the Blue Knights last year, 1,000-point scorer Janette Wadolowski, left behind a massive void the Southington offense is still scrambling to fill. There were supposed to be alternate sources of offense to help contribute, but an injury to Allison Carr and the loss of Madison Hulten has only made the Blue Knights’ holes more glaring, in a season where every bit of offense was going to be desperately needed. The result has been added frustrations to an extent that nobody saw coming. Southington’s slide is new and unfamiliar territory for Forgione, who has consistently averaged 15 wins per season as a head coach. While it’s a struggle he had never endured up to this point, there are still positives to take away. Close losses against a tough schedule can be as brutal as they are encouraging, and even after seeing their offense gutted in the offseason and early parts of the regular season, the Blue Knights have continued to battle. To play in the state tournament, Southington would have to win each of its last three games, which would put the team at the eight-win mark. The offense will have to improve, as will the defense in crunch time if the Blue Knights want to pull it off. Despite a season of frustrations that has often left the head coach speechless, a small glimmer of hope at a state tournament berth still remains. As long as it’s possible, the team won’t stop battling, even if recent history has delivered painfully close defeats. Posted in New Britain Herald, Southington on Wednesday, 6 February 2019 21:37. Updated: Wednesday, 6 February 2019 21:39.